Since its inception 25 years ago, Illinois Main Street has been extraordinarily effective at working with communities across the state to revitalize downtowns and commercial districts through place-based economic development. Illinois Main Street programs have collectively secured nearly $1.2 billion in public and private reinvestment, added nearly 1,000 jobs, created over 2,000 new businesses, and rehabilitated 800 buildings since 1992. Illinois Main Street (IMS) works with communities across the state to foster local economic development and enhance overall quality of life. IMS does this by providing hands-on training, statewide workshops, networking opportunities, and access to resources of community organizations focused on revitalizing their older or historic commercial districts. Learn more about our services. 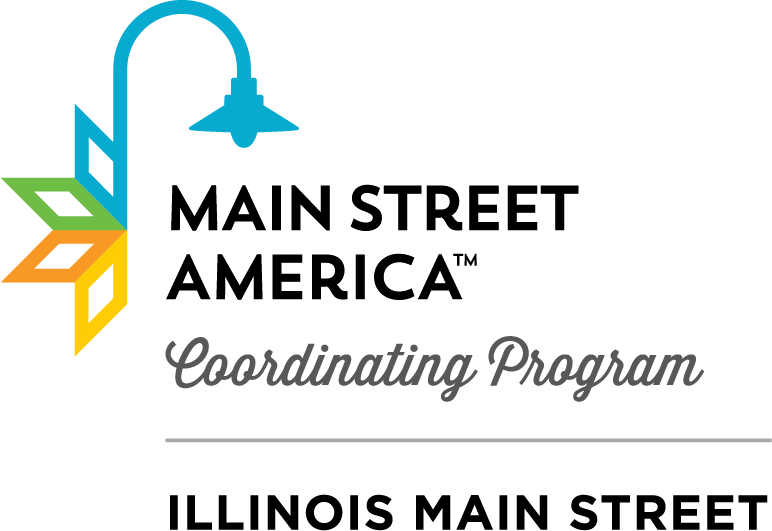 Illinois Main Street is part of Main Street America, a coast-to-coast network of organizations and individuals working to bring vitality and prosperity to downtowns across the country. Main Street America programs operate at the local, city, and state-wide levels. They are united by a commitment to preserving and enhancing the built environment, celebrating local history and culture, and creating local economic opportunity through the framework of the Main Street Approach. Main Street America is a program of the National Main Street Center. The Illinois Main Street program was founded by Lieutenant Governor Bob Kustra in 1993. The program was administered by the Lt. Governor’s Office and received design services from the Illinois Historic Preservation Agency until 2015 when the program lost all state funding. In 2018, with support from the Richard H. Driehaus Foundation, the National Main Street Center re-launched Illinois Main Street and is the current administrator. The IMS team has decades of combined experience in the broad range of issues that impact Main Streets. Have a question or interested in learning more? Please contact us - we are here to help!